Tips, Tactics, & Advice on Taking Our Favorite Gamefish. 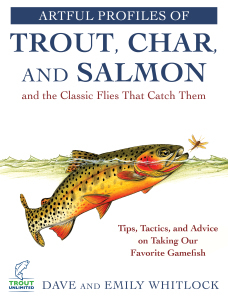 It is with passion and clarity that Dave Whitlock describes trout, salmon, char, and how to fly fish for them. This book is a collection of articles spanning Whitlock's career, all of which are essential reading for any fly-fisher, and it is packed with his stunning, original colorful art. Over the past fifty years, he has amassed an incredible amount of knowledge and Dave is a skilled teacher. Here, Whitlock deftly, accessibly, and thoroughly goes through a vast range of interesting topics. Hardcover 81/2x11" 184 pgs.